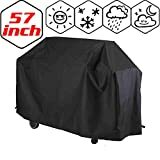 Waterproof— Durable and wear-resistant 190T polyester taffeta with pu coating to withstand 2000MM hydraulic pressure, supreme in expelling water to keep your bbq grill dry and clean. UV block—With pu coating layer, this cover tested to block 90% uv and added ability in oxidation resistance which means it can walk you through the whole season! Quality double stitching at the seam to add rip resistance. Elastic hem cord at the bottom allows you tighten or loosen the cover sleeve quickly and easily. Universal fit most brands gas, electric or charcoal grills. Comes with free zipper bag for convenient storage, ideal to take out with you in weekend gathering, outdoor activity, picnic or camping. Apart from the featured waterproof ability, it also has outstanding performance in oil rub resistance, easy to clean with water. Please measure your grill first before placing order. Suggest purchase a bit larger. 1. Please tighten the hem cord firmly when heavy rain and wind comes. 2. Suggest drain off seeper periodically to avoid overload. 3. Do not store with objects with sharp corner. 4. Dry out for storage to avoid bacteria from thriving. 1. If you have any question about product and delivery, please feel free to send us message. We will answer your questions the first time. 2. If you are not satisfied with the product or service, please kindly contact us first and send an email. We guarantee solve the problem for you timely.